For all the thousands of make up and skincare products that come out weekly occasionally one arrives which is such a clever idea you wonder why you haven't come across it before. From teaching make up workshops I know one of the most challenging make up techniques can be applying liquid eyeliners. 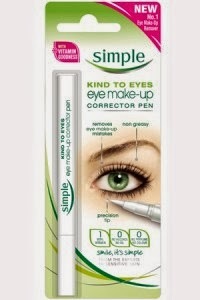 Achieving perfect french flicks can seem like an impossible task if you have a less than steady hand so the eye make up corrector pen by Simple is pure genius and at under a fiver totally affordable. 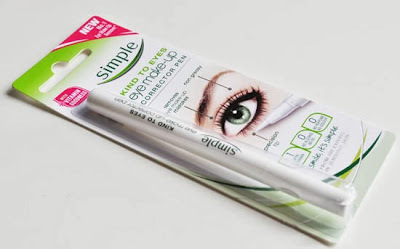 Its a basic idea, you apply your eyeliner, if it smudges or is wobbly rather than having to remove half your eye make up as you attempt to correct it you tidy it up with this fine nibbed pen. I also filmed a quick demo-be warned I am full of cold and look like holy hell, also its on my iphone so the quality is questionable but hey after that big sell if you still fancy a gander take a look. Leave a comment along with your email address in the comments section, and that's it. The winner will be chosen by random number selector on Sunday 6th October 2013.